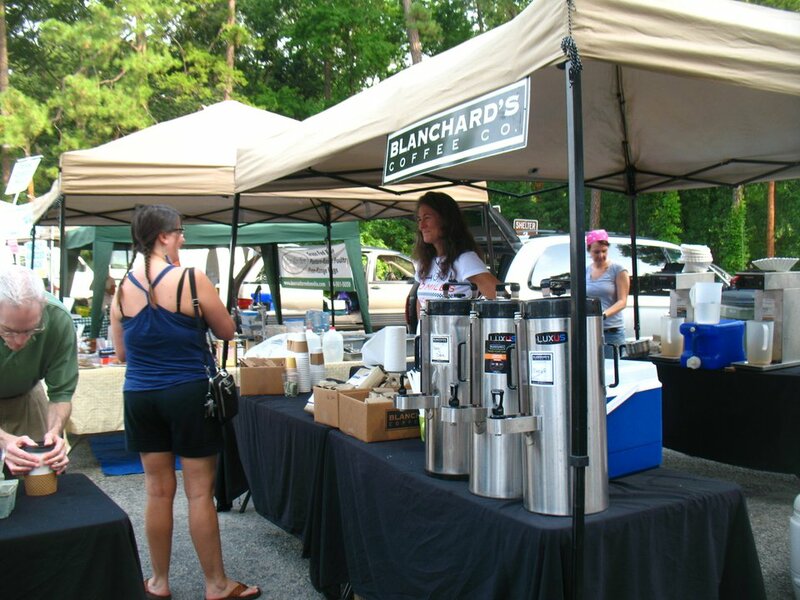 Meet Your Artisan #3: Blanchard’s Coffee Co.
Every Friday we’ll be featuring a different GrowRVA vendor, in their own words, to help build a stronger connection between the artisans at the market and RVA. Blanchard’s Coffee Co. has been caffientating Richmond since 2004. Their Roasting Lab is located in Manchester, and their coffee is available all over Richmond as well as from their website. Like, Share, or Comment on this post on Facebook, or share on Twitter, and you’re entered to win a coffee sampler gift box, a selection of three bags of fresh roasted Blanchard’s Coffee! Don’t forget to tag GrowRVA! We are Blanchard’s Coffee Co. and we are a Richmond, Virginia craft coffee roaster. At the South of the James Farmers Market, we sell cups of fresh-roasted coffee, our signature ColdBrew iced coffee and bags of our fresh roasted coffee to brew at home. We only have three products, and frankly, they’re all a hit! When it is hot outside our ColdBrew iced coffee is unstoppable. Our cups of hot, fresh roasted coffee are a constant hit and we always have tons of folks taking our featured whole-bean and ground bags of coffee home. We’ve been roasting coffee since 2004—over 8 ½ years! We’ve grown a lot since we started but we are still family owned and we still roast and package every single batch of coffee by hand. Some may be surprised to know our coffee is popular all over the globe—some of our most far-reaching clients include the US Coast Guard Cutter Legare, several coffee-loving individuals on military bases all over the world, and a coffee house in Jordan! We love all the vendors at the market—the community aspect of the South of the James Market is one of the most unique and special things Richmond has to offer right now. The South of the James Market is so popular now, our typical Saturday looks like trying hard to keep up with demand with a smile on our faces. We work hard, brew and serve as much coffee as possible and hope for a small lull when we can sneak out to one of the awesome food vendors for a market brunch treat! I LOVE Blanchard’s! Sometimes, if I am out walking on the flood wall I can literally smell the coffee roasting. It’s great drinking coffee that was roasted a few blocks from my building!